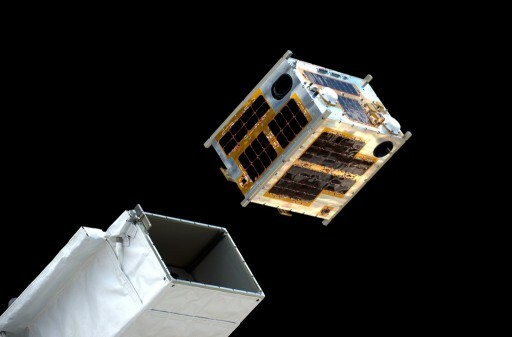 Diwata-1 was deployed by the Japanese Robotic Arm at 11:45 UTC to begin a mission of around one year to demonstrate Earth Observation instruments for small satellites. Outfitted with four payloads, the satellite will deliver imagery at a resolution of up to three meters while other instruments operate at lower resolutions but deliver a view of a wider area on the ground for a number of operational applications. 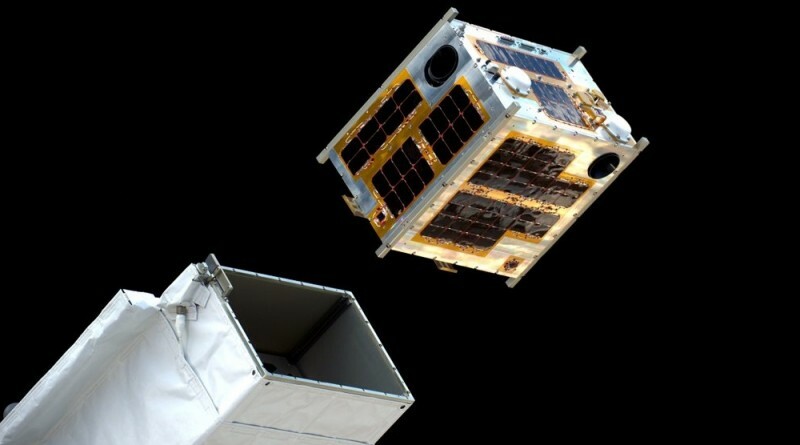 The 50-Kilogram Diwata-1 satellite is the first in a Japanese project to send 50 microsatellites into orbit in the coming decades to establish long-term operational Earth observation capabilities. A number of countries joined the effort including the Philippines with two satellites under Filipino operation currently planned for the project. 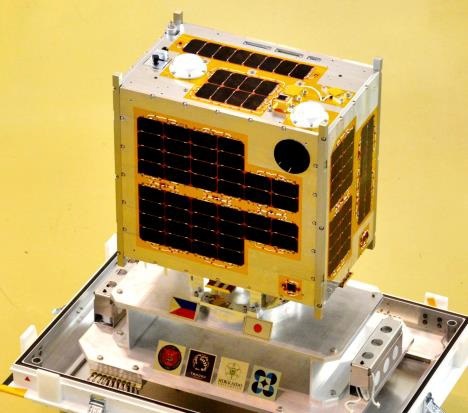 The Diwata-1 satellite is also part of the Philippine Scientific Earth Observation Microsatellite (PHL-Microsat) Program operated by the Department of Science and Technology (DOST). It is named after the Filipino mythological character Diwata (=Fairy). The overall goal of the program is to deliver Earth observation data for disaster management, weather forecasting, agriculture, fisheries, forest protection, mining, and urban planning. Of particular importance for the Philippines is the prediction of extreme weather systems like the El Niño phenomenon that has an impact on agricultural turnout. Development of the Diwata-1 satellite was completed by a team of engineers from DOST/ASTI (Advanced Science and Technology Institute) with guidance from Japanese engineers. 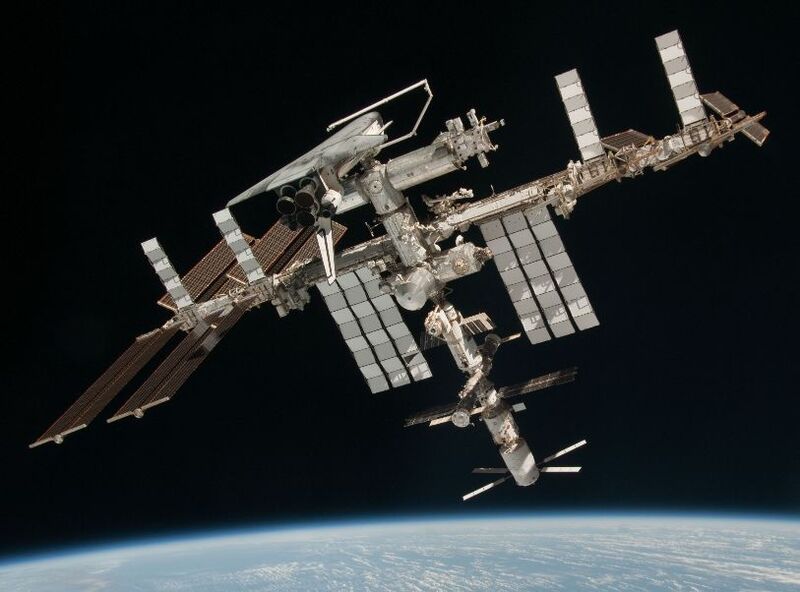 The spacecraft is 55 x 35 x 55 centimeters in size and uses body-mounted solar cells for power generation, an active attitude control system to enable precise pointing for imaging of ground targets, and a high-rate X-Band communications system for the downlink of Earth imagery. The Diwata-1 satellite hosts four payloads to deliver different Earth observation products including high-resolution imagery of ground targets as well as wide-field images to be employed in a number of applications. The High Precision Telescope HPT is a multispectral imaging telescope reaching a ground sampling distance of three meters from an operational orbit of 400 Kilometers. It covers a field of view of 1.9 by 1.4 Kilometers and in its focal plane sits a CCD detector array for the collection of multi-band imagery. The instrument can acquire full-color RGB imagery and a fourth channel is sensitive for the infrared band. HPT data will be useful in disaster assessment and management as well as environmental monitoring. The Spaceborne Multispectral Imager with LCTF (Liquid Crystal Tunable Filter) has a wider field of view of 52 by 39 Kilometers, achieving a ground resolution of 80 meters – suitable for monitoring changing vegetation and other environmental parameters over land and sea. It hosts a pair of CCD detector arrays covering wavelengths of 420-700 nanometers in the visible band and 650-1050 nanometers in the infrared range. The tunable filter can be used to select the wavelength to be imaged by the instrument. The Mid-Field Camera is classed as an engineering payload to be used in ground-reference determination of imagery delivered by HPT and SMI as well as the calibration of the attitude determination and control system to improve targeting over the course of the Diwata-1 mission. It covers a 121.9 x 91.4-Kilometer field of view and reaches a ground resolution of 185 meters. Finally, the Wide Field Camera installed on the satellite has a field of view of 180 x 134 degrees with an operational resolution of 7 Kilometers. It only operates in panchromatic mode, using a CCD detector to deliver black-and-white photos. WFC imagery will be used for cloud pattern observation and tracking of weather systems such as tropical storms. 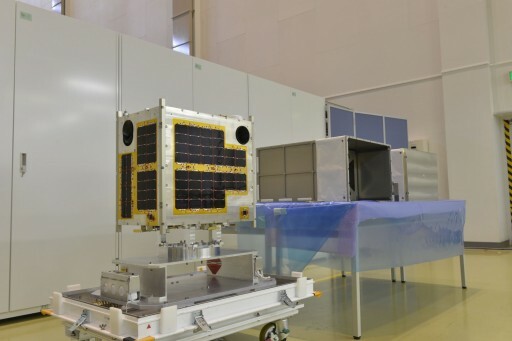 Processing of the microsatellite was completed back in January in Japan and it was shipped in a transport container to the United States for launch. Diwata-1 was launched aboard the Cygnus OA-6 mission lifting off on March 23 atop an Atlas V rocket and arriving at ISS two days later via a robotic grapple. 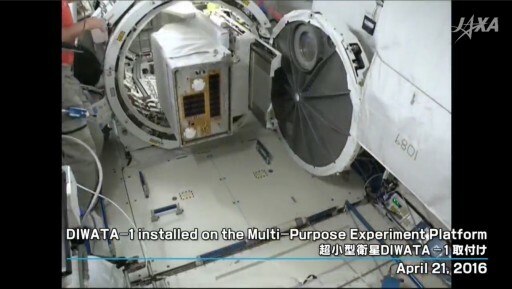 Diwata-1 was the 107th satellite to be deployed through the Japanese robotics architecture on ISS using a specialized deployer for Microsatellites installed on the Multi-Purpose Experiment Platform (MPEP). 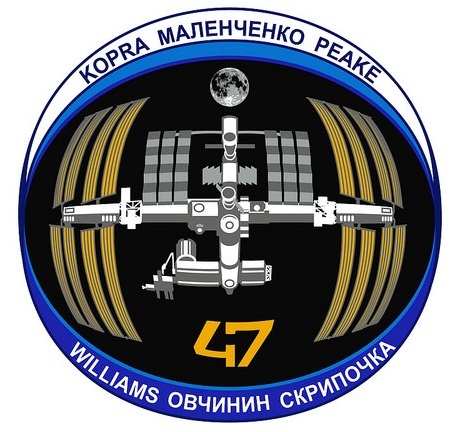 The MPEP was attached to the Slide Table of the Kibo module’s airlock on April 18 with installation of the deployer on the 21st. 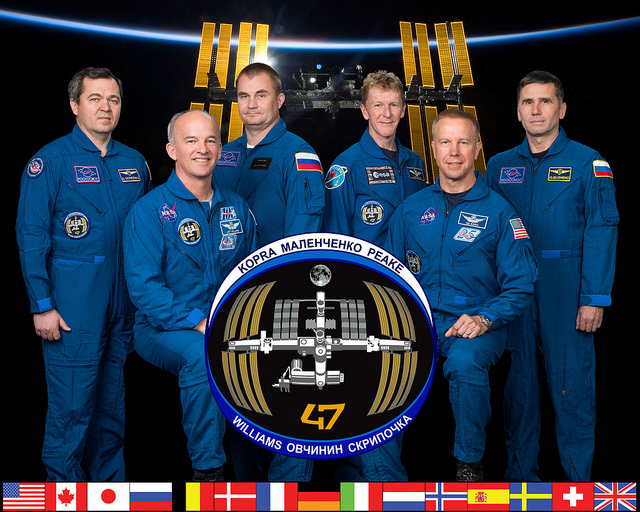 Extension of the Slide Table was completed in the overnight hours on Tuesday and the Japanese Remote Manipulator System grappled the platform and moved the deployer to the correct position for deployment. 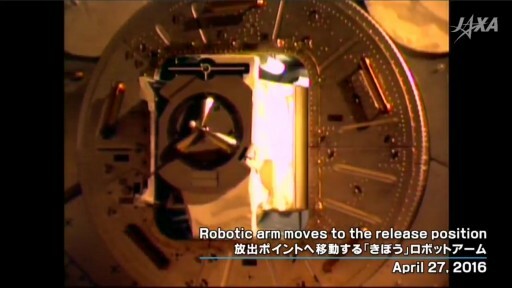 The deployment geometry was designed to avoid any possibility of a re-contact of the separated satellite with ISS on any subsequent orbits. 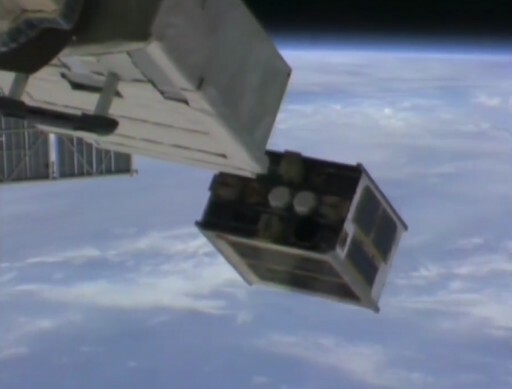 Release of the Diwata-1 spacecraft was commanded at 11:45 UTC and the satellite emerged from its container – using a spring-loaded mechanism to send the spacecraft on its way. Diwata-1 is scheduled to enter operational services within one week of deployment and its mission will last as long as the spacecraft can stay in orbit. A second Diwata satellite is currently in development for launch in 2017.